March 7th+ April 4th are the Admitted Student Weekends. $200 stipends have been emailed out to almost everyone. April 15th is the first deposit deadline. 1. Interview- All applicants (with complete application files) are encouraged to interview with a member of the admissions team as a part of the application process. Interviews may take place in person, by phone, or by Skype. Please contact the admissions office to schedule one. Reactivation Procedure: If you were not admitted, but want to be reconsidered the next year, send a letter or e-mail requesting reactivation of your application. We will request a new CAS (formerly LSDAS) report from LSAC. You may also submit an entirely new application online. We encourage you to submit additional evidence of academic ability if you decide to be reconsidered for admission. Decisions have been coming out in Friday waves. Interviews are basically an acceptance with 90% of the people who have reported receiving an interview in this thread, being offered. Last edited by chingwoo on Sat Jun 21, 2014 1:36 am, edited 14 times in total. Last edited by Xs20 on Wed Jul 31, 2013 1:16 am, edited 1 time in total. This thread is a great resource. Recent grads and current students answering questions abt the school. +1. Even if you don't attend it's a nice bargaining chip. Checking in. Best of luck to everyone. Soon to be 1L here. Just wishing everyone good luck! splitter scholarships go out yet? sublime wrote: Best of luck to everybody. I will try to answer questions as I can when I am there, just as the students were nice enough to do for us last year. As an aside, I am curious about their aid this year. Do they aim higher to try to snag more sticker low T14 people? Do they raise the standards for them, or keep them generally the same? I would imagine what they did last cycle is unsustainable. 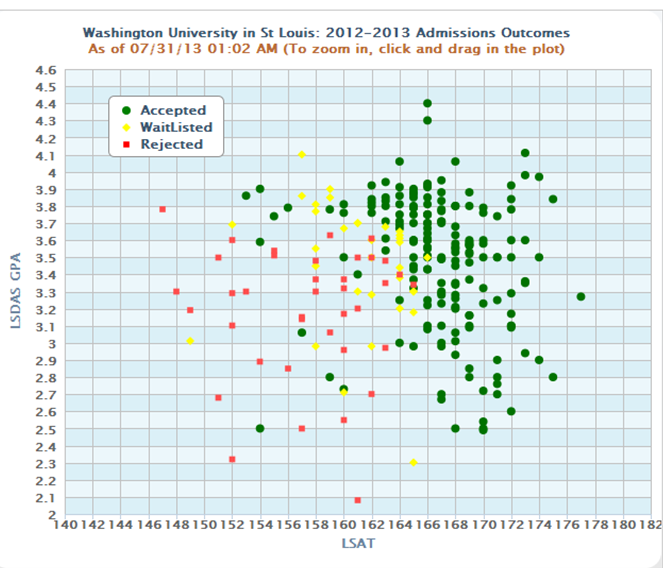 Despite Wash U's huge endowment, I doubt they are that thrilled to be spending that type of money on the law school. Also, some like Spivey have mentioned it was possible that it was an"emergency fund" type of situation - no idea if that is true or how that would affect this cycle. MISQUOTE! My lawyers on on the way to your place of dwelling. You are the man, I have turned around my lawyers. Also, subsequent interviews with senior level administrators pretty much conformed that this was indeed the case, they got a lump-sum capital injection from their central university. Ooops... perhaps I could have worded it better. MikeSpivey wrote: Sublime, et al. sublime wrote: You are the man, I have turned around my lawyers. Also, subsequent interviews with senior level administrators pretty much conformed that this was indeed the case, they got a lump-sum capital injection from their central university. Ha! Well, I guess I shouldn't have had my hopes up. Still extremely interested in the school, but as an extreme splitter I had some hope in my heart! checking in..Will we beat the C/O2016 398 page thread? Snowboarder1588 wrote: checking in..Will we beat the C/O2016 398 page thread?